If you have been on social media over the last week or so, you’ve no doubt heard about the Starbucks Red Cup Controversy. 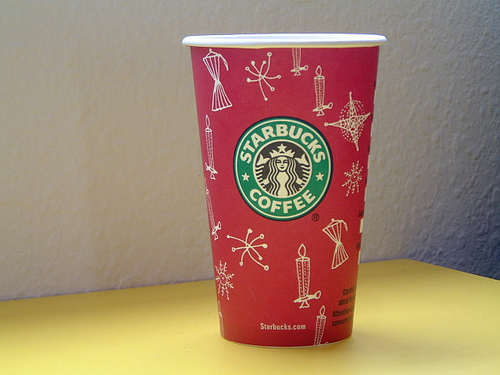 In a brilliant piece of faux-outrage social marketing, a would-be Christian Internet Personality put together a video complaining that Starbucks had removed Christmas from their cups and asked people, when ordering their lattes, to say that their name was “Merry Christmas”, so that baristas would be forced to write it on them. This video describing the latest Secular Depravity Ruining Our Country, which conveniently has absolutely no basis in reality, got over half a million likes, the endorsement of a particularly famous toupeed troll-like creature, and was breathlessly picked up as a national “news story” by a lot of journalistic organizations that apparently have nothing better to do with their time. The Christian internet responded by furiously disowning the controversy, with posts like this or this or this. However, in this rush, there is one question that I have not heard any Christians asking of themselves. What does it mean that most people think it’s entirely plausible that Christians would be outraged by this? To be more blunt, isn’t this sort of huffy freak-out perfectly consonant with our pattern of behavior as a people? Every year, a large, visible group of Christians violently frets about the “War on Christmas”, which somehow, is not about people going hungry or rampant consumerism, but about whether or not people will say “Merry Christmas” to you. Anytime someone tells a joke about Christians on Facebook, there are at least three aggrieved comments from people that prove that utterly lack a sense of humor about themselves. If they visit many of our churches (yes mainliners, I’m looking at you), they will inevitably encounter several people who are determinedly angry at families for doing soccer on Sunday, at projectors over hymnbooks, at pastors who wear jeans, or people in general for not being as good as they are. If they regularly visit other churches, they may regularly encounter Christians who are so methodically mechanistic in their relationships that you really believe that they’d do or say anything to get you in the doors of a church, even if that means lie, cheat, or demean others. All our “That’s Not Us!” defenses don’t account for much when for many people, the entire witness of the rest of their lives suggests that Christians are, in fact, people who will get quite angry over something as stupidly trivial as the logo on a Starbucks cup. What, you haven’t heard of it? Good for you. However, if you’re feeling a little masochistic, you can find out more about it from the Atlantic, from Eater.com, or Christianity Today. While quite visibly not freaking about issues like hunger, poverty, or violence, which it seems quite likely Jesus cared a lot more about. Or give away guns. Seriously, multiple churches have done this.